MRI contrast agents improve visibility of internal body structures. 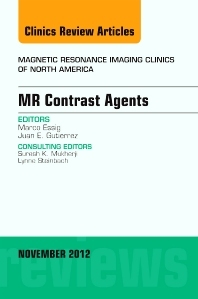 This issue offers a complete, practically focused review of the use of a variety of contrast agents for MR Imaging. A contrast agent not only must be safe, but also efficacious and cost-effective, and the articles in this issue address all three of these concerns and the uses of contrast agents for a variety of applications.